The common thread throughout the first two articles in this series has been the need for electrical inspectors to be armed with the facts to counter challenges to electrical safety. Knowing the facts better enables inspectors to perform high-quality inspections that benefit the installer or electrical contractor, end users and the local jurisdiction. It also allows them to be prepared for virtually any contingency, including everything from a concern expressed by an installer or contractor about an installation to hard questions from the town fathers about the value of inspections. But keeping current, especially regarding theNational Electrical Code (NEC)and any state or local amendments, takes effort, especially today. Electrical inspectors in many communities are being asked to do more — including some who are now expected to do inspections in other disciplines, like mechanical or plumbing. An ever-expanding list of responsibilities limits the crucial time that’s necessary for inspectors to stay current with regard to electrical code changes. In the final installment of this series, we will explore the nuances of developing a continuing education strategy, educational sources that should be pillars of such a strategy and finally, why it’s absolutely necessary for both the good of the individual inspector and the profession as a whole. Inspectors should be viewed as a resource, and the only way to effectively accomplish that goal is to take the time to develop a thorough command of the facts. Qualified, well-trained electrical inspectors will benefit all parties involved with a building project, particularly the installer or electrical contractor, with the knowledge they possess. That said, it bears mentioning that it’s the obligation of inspectors, whether the state requires it or not, to stay current and understand what’s truly required by code. Because many inspectors have worked elsewhere in the industry, such as an installer or contractor, there can be a tendency to interpret an installation through the lens of “what I used to do,” rather than what the code actually states. True, 2008NEC90.4 says inspectors have “the responsibility for making interpretations of the rules, for deciding on the approval of equipment and materials, and for granting the special permission contemplated in a number of the rules.” But there can be more than a fine line between interpretation of the code and personal preference. Taking a position that can’t be backed up by the code can leave an installer or contractor peeved, which in turn creates the likelihood that that negative perception will spread. If unchecked, that can call into question the credibility of the inspection profession, making it easier for cities and municipalities to slash budgets or require inspectors to assume all types of inspections … and complete as many of them as possible in the same amount of time (or less) than it takes to do a thorough electrical inspection. This means an unsafe installation could be overlooked, resulting in a safety hazard for end users. But while the negative effects of a substandard inspection can compound, so can the positive effects of a thorough inspection that leaves an installer or contractor smarter and better equipped for the next job. It all starts with an implicit knowledge of theNEC, which is why inspectors should craft and implement a multi-tiered continuing education strategy that utilizes proven resources that helps build code knowledge and avoids opinion, conjecture and inaccuracies. As with virtually any educational venture, there are multiple resources at an inspector’s disposal, particularly online. But great care should be taken when spending the limited resources of time and budget to choose the right opportunities that comprise a continuing education strategy. The best rule of thumb is to research all opportunities and narrow them down to the ones with credentials that are most solid. The following steps are recommended to achieve that end. Gravitate toward interactive educational experiences. 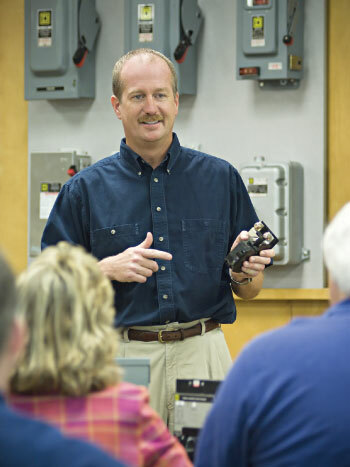 The best educational experiences are typically those where an electrical inspector can interact with the person who is presenting, such as a seminar, or in the case of a panel discussion, the panelists. If an inspector doesn’t quite grasp a key concept, or further clarification is necessary, he can get those issues addressed as soon as the seminar or meeting adjourns; indeed, it’s common to see a line of inspectors waiting to speak to the presenter following a seminar at a local or regional International Association of Electrical Inspectors (IAEI) event. IAEI and the National Fire Protection Association (NFPA) also offer sit-down classes, which affords a great opportunity for an inspector to speak with the instructor after the class has concluded for the day, or to stay in touch via e-mail or phone long after the class is finished. Focus on the code first, then products. An inspector can find a lot of information on manufacturer Web sites about individual products. However, for inspectors, the most effective information manufacturers can provide is how the product relates to the code, versus explaining features of the product itself. Having spent a significant amount of time working with and providing educational programs for the inspection community, this author can attest to the importance of keeping education centered on the code itself. There are situations where a given installation relates to a specific manufacturer’s product. That manufacturer can be an invaluable source of information to make sure that what the inspector sees in the field fits with the manufacturer’s expectations about how the product should be used. Be wary of experiences that are unmoderated and unsupervised. While the Internet can be a great way to conduct research, including learning about seminars, trade events and online courses, inspectors should be sure to understand the credentials of information sources. This is something that is usually not easily done on Internet message boards, blogs or chat rooms, which can include misinformation. True, the Internet is a great way to exchange information, but it’s important to validate that information with other trusted sources to ensure it’s accurate. Network with trusted colleagues. Inspectors have heard many times, “You are the only person that is making me do this,” as it relates to a particular requirement for code compliance. Building relationships with industry peers, like other electrical inspectors, members of code-making committees, class or seminar instructors and moderators and members of panel discussions, can build an inspector’s database of trusted resources. Plus, in this era of cellphones and e-mail, those colleagues, particularly other astute inspectors, can provide virtually instant advice on a thorny issue, sometimes even on the job site itself. These connections also provide an excellent opportunity for an inspector to realize he is likely not the only person that enforces a particular requirement. Include a component regarding effective communication. While understanding the nuances of the code should be the primary objective of a continuing education strategy, inspectors should also consider opportunities related to effective communication and conflict resolution. In short, it’s important to know the most effective ways to convey sometimes unpleasant information. Remember, the end goal is to end up with a safe, code-compliant installation and yet build a strong relationship with an installer or contractor, and sometimes, it’s not what one says, it’s how it’s said that can make all the difference. Organizations like IAEI can direct inspectors to third-party courses in this area, while some IAEI chapters offer seminars at local or regional meetings. Inspectors who are not IAEI members can still partake in these events, though they may be faced with a higher fee than IAEI members (which is another good example of the advantages of IAEI membership). It also bears mentioning that researching opportunities for a continuing education strategy will require time, but so will taking advantage of those opportunities. With all the demands being placed on electrical inspectors today, it might be tempting to skip a seminar or meeting until work is less hectic, but consider that it’s a golden opportunity to learn, which can help an inspector avoid a substandard inspection. A substandard inspection not only puts that inspector’s credibility at risk, but that of the profession as a whole, which can lead to other consequences, like reduced budgets and an increased workload through having to take on inspections in other areas, like mechanical and plumbing. Making the time commitment for a continuing education strategy will underscore the fact that everyone, including installers and contractors, desire safe, compliant electrical installations. It should not be the inspector’s objective to find something to write up on every job, but instead to look with a keen eye and ensure that an installation is code-compliant. An inspector that has an implicit understanding of the facts about the code is best positioned to achieve that end. A properly trained inspector can be more efficient, effective and provide better customer service — all of which will help meet the challenge of increasing electrical safety. Previous articleLuminaire disconnects and motors? Jim Pauley was named President and Chief Executive Officer of the National Fire Protection Association (NFPA) in 2014. NFPA is a global, nonprofit organization devoted to eliminating death, injury, property and economic loss due to fire, electrical and related hazards. Prior to joining NFPA, Mr. Pauley concluded a 30 year career in the electrical and energy industry where he most recently served as Senior Vice President, External Affairs and Government Relations for Schneider Electric. During his career, Jim was actively involved in NFPA serving in various capacities including chairman of the NFPA Standards Council. Mr. Pauley has served in a number of leadership positions including chairman of the board for the American National Standards Institute (ANSI) and chair of the High Performance Building Council for the National Electrical Manufacturers Association (NEMA). He has received numerous awards and recognitions including his recent induction into the Engineering Hall of Distinction at the University of Kentucky. He holds a bachelor’s degree in Electrical Engineering from the University of Kentucky and is a licensed professional engineer. To play this game, you need a sharp eye, a quick mind and a 2017 National Electrical Code book. How well do you know the NEC? What’s NEW about AFCIs in the 2014 NEC? IAEI, as the keystone of the electrical industry, is a membership driven, non-profit association promoting electrical safety throughout the industry by providing premier education, certification of inspectors, advocacy, partnerships and expert leadership in electrical codes and standards development. © Copyright 1928-2017 International Association of Electrical Inspectors.